Construction activities have begun and include restriping portions of the freeway and setting up concrete barrier on the outside of the freeway to protect work areas for activities such as tree removals and grading. Weather permitting, more significant construction activities, such as the first paving operations and bridge demolition activities, are anticipated to commence later this year. The local streets are laid out in a grid system and then the freeway was overlaid at a 45 degree angle. So at many of the interchanges, there is both a north-south bridge and an east-west bridge that needs to be replaced. Most bridges are reconstructed using a two-stage approach. This means the bridges will not be shut down completely, but will be built one half at a time. The one-stage bridges, will be demolished and rebuilt all in one phase and completely closed to the public during their reconstruction. The high number of bridge replacements is one of the project’s critical challenges. We have and will continue to spend a lot of time working with the cities along the freeway on the sequencing of bridge construction to minimize disruptions to the surrounding communities as best as possible. For detailed information on the 405 Express Lanes, please go to the 405 Express Lanes tab or click here. As part of the project, there are some locations along the 16-miles of the project where we require temporary construction easements (TCE’s) or partial acquisitions. If you have further questions regarding these matters, please contact the Community Outreach Team, by calling 888.400.8994 or by emailing 405project@octa.net. The OCGO project, Measure M, being constructed in cooperation with Caltrans, will be funded mostly through a combination of local, state and federal funds, with the express lanes portion of the Project paid for by those who choose to pay a toll and use the 405 Express Lanes. OCTA secured a $629 million federal Transportation Infrastructure Finance and Innovation Act (TIFIA) loan for the I-405 Improvement Project, which will pay for a major portion of the $1.9 billion worth of freeway improvements set to begin construction by early next year. Orange County taxpayers will save $300 million in interest costs thanks to the U.S. Department of Transportation TIFIA loan program. For information regarding employment and contracting opportunities please contact OC 405 Partners, comprised of OHL and Astaldi, directly by visiting their website http://www.oc405partners.com/. The Design-Build contract was awarded to OC 405 Partners, a joint venture team comprised of OHL and Astaldi, in November 2016. A joint venture is a new firm formed to achieve specific objectives of a partnership like temporary arrangement between two or more firms. Joint ventures are advantageous as a risk reducing mechanism and in pooling of resource for large projects. This type of partnership between multiple firms also occurred on the SR-22 Project (also a Design-Build project). One firm has a focus on design and one has a focus (or expertise) is construction. Due to this project’s massive scope and complexity, one firm is not capable of taking the entire project on by itself. During the procurement of the contract, OCTA was in search of design-build teams that are committed to safety, quality, have proven experience in administration, design and construction, will bring innovative design-build approaches to ensure timely completion, and are willing to partner with the OCTA and Caltrans for the mutual success of the project. The OCTA Community Outreach team is committed to educating the public on the project and responding to the community’s que and concerns. We are your resource for up-to-date information on the project. Coordinating with city staff, elected officials, emergency service providers, as well as with the media. If you are interested in a presentation or briefing for your community or group, please email our team at 405project@octa.net. The questions and answers below provide current information on the project to improve Interstate 405 (I-405) in Orange County from State Route 73 to Interstate 605. Why are improvements needed on I-405? The I-405 freeway experiences heavy traffic congestion and conditions are expected to worsen. Built in the 1960s, the freeway carries between 257,000 and 370,000 vehicles per day depending on location. Near the L.A. County line, the I-405 is the most heavily traveled freeway in the nation and both the regular lanes and carpool lanes are congested daily during rush hour and on weekends. Traffic along the corridor is expected to grow approximately 35 percent by 2040. Additional lanes and other improvements are needed to improve traffic flow, accommodate growing traffic demand, relieve congestion, and improve overall mobility. The I-405 Improvement Project is critical in order to accommodate expected employment, population and housing growth in not only Orange County but throughout Southern California. What is planned for the I-405 Improvement Project? The project will improve 16 miles of I-405 between the SR-73 freeway in Costa Mesa and I-605 near the L.A. County line. The project includes adding one regular lane in each direction from Euclid Street to I-605 and making improvements to freeway entrances, exits and bridges. It also will construct the 405 Express Lanes, two lanes in each direction from SR-73 to I-605. The new express lanes – incorporating the existing carpool lanes and connectors that opened in 2014 – will give solo drivers the choice to speed up their commute for a toll, and carpoolers may ride in the lanes for free. Where will vehicles be able to enter and exit the toll lanes? There are seven access points in between SR-73 and I-605, giving drivers sufficient opportunity to reach every interchange and business along the corridor, including the Westminster Mall, car dealerships, Bella Terra, Goldenwest College and South Coast Plaza, and any other destination. These intermediate access locations minimize right of way impacts to the adjacent community. Additional access points would likely have significant right of way impacts. 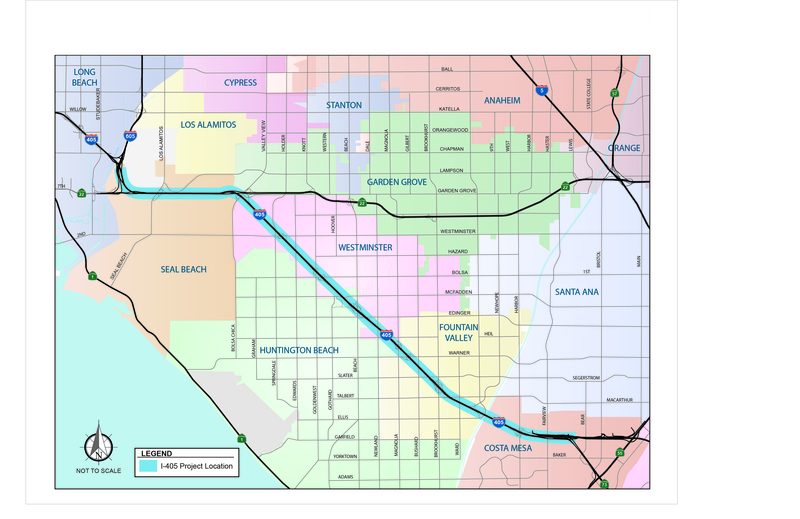 The intermediate access points at Magnolia/Warner and Bolsa/Goldenwest were selected largely to serve Beach Boulevard which is roughly midway along the corridor, has the highest arterial volume of any of the arterials crossing the freeway, and has the largest interchange volumes in the corridor. Are FasTrak® transponders required to use the 405 Express Lanes? The 405 Express Lanes will utilize electronic tolling to keep traffic flowing and there will be no cash payments or toll booths. Because of this, transponders will be required for customers to use the express lanes when they open. OCTA will continue to explore technology that may in the future allow drivers to use the express lanes without a transponder. What is the overall benefit to the project to include the 405 Express Lanes? Those who choose to pay a toll improve traffic for everyone by freeing up space in the regular lanes, including the additional lane in each direction that is being added as part of the project. Also, if there are excess toll revenues beyond operational, maintenance and financing costs, that provides funding for additional improvements in the corridor. As an example, to date the 91 Express Lanes has provided more than $15 million for improvements to the freeway and for public transit in the 91 corridor. I-405. Rush-hour commutes in the regular lanes on I-405 are expected to be reduced by almost 30 minutes versus only building one regular lane in each direction. The bottom line is you don’t have to pay one penny more and you’ll be home to your family a half-hour sooner. What are the toll policy goals of the 405 Express Lanes? The OCTA Board of Directors (Board), which is leading the freeway improvement project, voted to adopt a number of goals that would guide the development and implementation of the 405 Express Lanes toll policy. The goals focus on providing express lanes customers with a reliable commute while optimizing the number of cars that can utilize the lanes at free-flow speeds, and encouraging ridesharing and transit use. Provide express lanes customers with a safe, reliable, predictable commute. Balance capacity and demand to serve customers who pay tolls as well as people who rideshare or use transit. Generate sufficient revenue to sustain the financial viability of the express lanes. Ensure all covenants in the financing documents are met. Ensure any potential net excess toll revenues are used for Interstate 405 corridor improvements. The 405 Express Lanes will use congestion management pricing. This type of pricing was pioneered on the 91 Express Lanes, also operated by OCTA. Congestion management pricing is designed to optimize express lanes traffic at free-flow speeds. To accomplish this OCTA monitors hourly traffic volumes. Tolls are increased when traffic volumes consistently reach a trigger point where traffic flow can become unstable. If traffic drops below the optimal traffic volume, tolls are lowered to encourage usage. The tolls can vary by hour, day of the week and direction of travel. Traffic volumes are continuously monitored and if warranted, tolls are adjusted quarterly. This approach balances traffic engineering with good public policy and gives customers an opportunity to know the toll price before they make their trip. What is the toll policy for carpools? The graphic below depicts the initial 405 Express Lanes Toll Policy adopted by the OCTA Board on May 23, 2016. Why does the proposed 405 Express Lanes Toll Policy change after 3.5 years? Two goals of the 405 Express Lanes are: (1) balance capacity and demand to serve customers who pay tolls as well as people who rideshare or use transit, and (2) generate sufficient revenue to sustain the financial viability of the express lanes. The first 3.5 years after the 405 Express Lanes open is a ramp-up period. In order to continue to guarantee free-flow speeds and achieve the two goals listed above the toll structure must be adjusted. Why are two person carpools only free during certain hours and during the first 3 ½ years? Will zero emissions vehicles be allowed to drive for free in the 405 Express Lanes? At this point in time, we are planning to treat zero emission vehicles similar to HOV3+ vehicles – allowing free travel (but they will still require a transponder). However, OCTA will comply with the legislation that is in place when the 405 Express Lanes open in 2023. The current state legislation (which includes information on white [hybrids] and green [zero emissions] vehicle sticker programs) expires in 2019. If it is not extended, the OCTA Board of Directors may ask staff to develop a policy to address this matter. For more information on California’s Zero Emission Vehicle (ZEV) Program, please visit http://www.arb.ca.gov/msprog/zevprog/zevprog.htm. If you have further questions, please contact The Community Outreach Team, by calling 888.400.8994 or by emailing405project@octa.net. Click on the link below for a list of closures and detours scheduled this week. Please note, this list is updated every Friday and occasionally throughout the week, depending on changes in construction activity. The latest information is always available on our interactive map at octa.net/405map. Watch the videos below to check out the new I-405 Improvement Project. Each one provides different information about various aspects of the 16-mile project. OCTA in cooperation with The California Department of Transportation (Caltrans) is widening the San Diego Freeway (I-405) between State Route 73 (SR-73) and Interstate 605 (I-605).The project will improve 16 miles of I-405 between the SR-73 freeway in Costa Mesa and I-605 near the L.A. County line. The project includes adding one regular lane in each direction between Euclid Street and I-605 and making improvements to freeway entrances, exits and bridges. In addition, the project will add the 405 Express Lanes, incorporating the existing carpool lanes and a new lane in each direction between SR-73 and I-605. The 405 Express Lanes will give solo drivers the choice to speed up their commute for a toll and give options for carpoolers to use the lanes for free. When the express lanes open, two-person carpools will pay a toll only during peak hours and carpools of three or more will be free at all times. The general purpose lane portion of the project is an OCGO, formally Measure M (Orange County's half-cent transportation sales tax), project and will be funded by a combination of local, state and federal funds, with the express lanes portion of the project financed and primarily paid for by those who choose to pay a toll and use the 405 Express Lanes. Because of the high demand for the I-405 and the need to stay within the existing right of way, the project cannot provide enough additional lanes to eliminate congestion. The 405 Express Lanes, however, will provide a fast, stress-free travel option. Because the amount of traffic in the 405 Express lanes will be optimized by raising and lowering tolls in response to traffic demand, the 405 Express Lanes will be more predictable and move more vehicles per lane during peak periods than the regular, general purpose lanes. Solo drivers in the 405 Express Lanes will pay the full toll and carpools are anticipated to be offered discounts or free travel. The toll policy has not been finalized yet but it will be designed to provide customers with a safe, reliable, congestion-free commute. The 405 Express lanes will offer people a choice to travel faster when they absolutely need to. In 2040, it's expected to take 29 minutes to travel during rush hour from SR-73 to I-605 in the general purpose lanes after improvements to the I-405 are complete. That commute can be reduced to 13 minutes if a driver chooses to take the 405 Express Lanes. The Design-Build contract was awarded to OC 405 Partners, in November, 2016 and they are currently developing a project schedule. Please keep in mind that because this is a Design-Build project, it’s possible that work may be simultaneously performed in multiple areas the 16-mile stretch (I-605 to SR-73). To sign up for our email alerts, please go to the Stay Informed Tab. In the meantime, please contact our team should you have any questions. We are happy to assist. WHAT:Partial demolition of the Bolsa Avenue bridge is scheduled for Saturday, April 27. Crews will demolish a portion of the bridge over northbound (NB) and southbound (SB) I-405. WHERE:The freeway will be closed in both directions between Beach Boulevard and Goldenwest Street during the demolition. Detours will be in place, and signs will be posted to guide motorists around the closures. Motorists should expect delays and use alternate routes if possible. To view all closures and detours, please visit the interactive map or click here for a PDF list. *Please be advised that this work may be loud. Dates and times are subject to change due to unforeseen operational factors or inclement weather. WHERE: Northbound Bolsa Chica Road will be reduced to one lane intermittently between Duncannon Avenue and Garden Grove Boulevard. WHERE: Adjacent to Bolsa Chica Road bridge, on the southbound side of I-405. WHY: These large piles of dirt will remain in place for up to three months to compact the soil beneath them for future bridge support structures. Crews completed the partial demolition of the east side of the Fairview Road bridge over I-405. Other activities will take place during the day, behind k-rail and at night, using freeway lane closures. The demolition and reconstruction of the Fairview Road bridge is part of the I-405 Improvement Project, which adds a general-purpose lane and a tolled Express Lane facility in each direction of the 16-mile project. The Fairview Road bridge, one of 18 to be reconstructed as part of the project, will be partially closed for up to 24 months. For more information about the bridge reconstruction, see the PDF documents below. WHERE: Adjacent to Goldenwest Street, on the northbound and southbound sides of I-405. Crews will also be working near the center median columns on the freeway, behind lane closures. WHY: Pile installation is necessary to construct the foundation of the new Goldenwest Street bridge. WHERE: Adjacent to Magnolia Street bridge, on the NB and SB sides of I-405. WHEN: As early as 7 a.m. to 4 p.m. Monday April 8, for approximately three weeks. Crews may conduct pile installation activities at night. WHY: Pile installation is necessary to construct the foundation of the new Magnolia Street bridge. WHERE: NB Magnolia Street will be reduced to one lane intermittently between the Boomers driveway and Heil Avenue. The demolition and reconstruction of the McFadden Avenue bridge is part of the I-405 Improvement Project, which adds a general-purpose lane and a tolled Express Lane facility in each direction of the 16-mile project. The McFadden Avenue bridge, one of 18 to be reconstructed as part of the project. WHAT: Falsework construction, which includes installing wooden and steel beams to support the reconstruction of the new Slater Avenue bridge. WHERE: Adjacent to Slater Avenue, on the NB and SB sides of I-405. The freeway will be closed in both directions between Brookhurst Street and Magnolia Street. NB and SB freeway closures will not be concurrent..
SB I-405 will be closed between Magnolia Street and Brookhurst Street. Construction activities will continue during the day and at night to rebuild the bridge. The demolition and reconstruction of the Slater Avenue bridge is part of the I-405 Improvement Project, which adds a general purpose lane and a tolled Express Lane facility in each direction of the 16-mile project. The Slater Avenue bridge, one of 18 to be reconstructed as part of the project, will be closed for approximately 12 months. WHAT: Partial demolition of the Westminster Boulevard bridge. Crews will demolish a portion of the bridge over northbound (NB) and southbound (SB) I-405. WHERE: The Westminster Boulevard bridge over NB and SB I-405. The freeway will be closed in both directions, between Westminster Boulevard and Springdale Street. WHEN: As early as, 11 p.m. to 8:30 a.m., Saturday, May 4, to Sunday, May 5. Detour information will be included in the project interactive map and in future alerts. WHERE: Sugar Drive will be fully closed between Cascade Lane and Rushmoor Lane. WHEN: As early as 8:30 a.m. to 4 p.m., ongoing, through Friday, April 19, on weekdays. The closure will be picked up after each daily shift, at approximately 4 p.m.
WHAT: SCE will be conducting utility work. WHERE: Beach Boulevard will be fully closed between McFadden Avenue and Edinger Avenue. Center Avenue, between Huntington Village Lane and Beach Boulevard, will also be closed. Access to Center Avenue will be maintained via Gothard Street and Huntington Village Lane. All closures and detours will be included in the interactive map and on our closure list. WHAT: Crews will demolish the existing I-405 sound wall adjacent to NB I-405 between McFadden Avenue and just north of the railroad crossing. WHERE: NB I-405, between McFadden Avenue and just north of the railroad crossing. WHEN: As early as Monday, April 15: 9 p.m. to 6 a.m. on weekdays, to demolish the sound wall. Demolition of the wall requires lane closures on the freeway, which can only be done at night. Construction of the new wall is anticipated to begin at the end of April or in May and may take approximately six to eight months to complete. WHAT: Crews are working on the foundation for the new wall and loading out materials. WHERE: Milan Street, between approximately Stratford Avenue and 200 feet south of Lowell Circle. WHEN: As early as 9 p.m. to 6 a.m., Monday, April 15 to Saturday, April 20. Have a representative from the Project speak to organization. Note: Notifications are sent by email, text and automated call system. Questions, please call the 405 Community Outreach Team at 888-400-8994..
Standard text messaging fees and rates will apply per your current contract with your wireless carrier. OCTA will use your phone number solely for I-405 Improvement Project text message alerts. Your information will not be sold or used for any other purpose.